Every year, the Clinical Data Interchange Standards Consortium (CDISC) holds several Interchange events that take place in the US, Europe and Asia. These meetings have several goals: to give CDISC users the opportunity to present solutions to data challenges that arise in the day-to-day use of these standards; to provide new or novice users training in CDISC standards; to allow team members, most of whom are volunteers, the chance to meet and network with one another; and to provide a forum for industry and regulatory agencies to collaborate and provide feedback on recent accomplishments and future directions of CDISC. While JMP Clinical has been a part of past CDISC meetings, this was my first time attending the event. 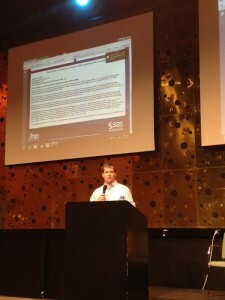 This year's European Interchange took place in Stockholm, Sweden. There was a poster session at the Interchange this year, for which I submitted a poster to present how CDISC standards enable the automatic generation of adverse event (AE) narratives, thus providing a more comprehensive understanding of patient safety. Though the session was small, it did provide me an opportunity to discuss the AE Narrative process in JMP Clinical, and to highlight new features that allow a user to summarize lab, vital sign and electrocardiogram data prior and subsequent to the summarized adverse event. The poster attracted a good deal of attention from individuals familiar with and new to JMP Clinical, even among CDISC Interchange organizers. In fact, CDISC leadership recognized two posters as particularly noteworthy, one of which was the AE Narrative poster. My reward for the poster session was the opportunity to address the audience in the final plenary session. During my brief talk, I stressed that while CDISC standards enable quicker regulatory review and allow us to perform routine tasks faster, easier and cheaper, they should also allow us to take our analyses and insights to the next level: allowing for straightforward review of complicated clinical trial data at the push of a button; using animation and rich graphics to highlight important safety signals; and creating clinically meaningful and user-customizable cross domain displays and summaries. A few years ago, it may have been difficult to imagine it possible to generate user-customizable adverse event narratives or patient profiles directly from the source data sets, much less at the push of a few buttons. However, these tools illustrate the power of data standards, and why the CDISC mission is so important. Further, these tools communicate the power of standards to individuals less familiar with data and programming concepts. Why are standards important? Look at the analyses available at your fingertips! Pushing the next level is where our mindset should be, and these are the kinds of analyses and programs I hope to continue developing for JMP Clinical. Ultimately, these powerful new tools will give us a clearer picture of patient safety in clinical trials.